Realtors Property Resource® (RPR®) is NAR’s exclusive, online real estate database that provides REALTORS® with data on over 166 million parcels of property in the United States including tax assessment and public record information, notice of default, REO, foreclosure and pre-foreclosure information, MLS/CIE-provided information, zoning, liens, permits, school districts, flood plain maps, demographics, and much more – all in one location. RPR® reinforces the value REALTORS® bring to the transaction by keeping them ahead of the technology curve and better able to serve today’s technology-empowered consumer. This course equips REALTORS® with the tools and information necessary to help their clients and customers make informed real estate decisions. How Much Is This House Worth Today? Focus is on the uses of automated valuation models (AVMs), the shortcomings of leading online AVMs and how the Realtors Property Resource® platform equips the licensee with closing the accuracy gap between automated estimates (sales price) and market realities (home values). Consumers Don’t Believe Everything They See on the Internet. Right? When AVMs under- or overestimate home values, real estate professionals must explain the inaccuracies before they can present reliable information about market conditions and pricing. That’s where RPR’s Realtor Valuation Model® (RVM®) gives REALTORS® the competitive edge over consumer-facing AVMs. Market data is not market intelligence. Price trends cannot describe the experience of living in a home and neighborhood. This chapter demonstrates how REALTORS® can combine their expertise with RPR’s reports to education consumers about what’s happening in a particular marketplace. This chapter focuses on extending the value of RPR® reports beyond the transaction. The reports offer a powerful prospecting tool for staying top-of-mind with potential customers and clients as well as keeping them informed about local market trends. 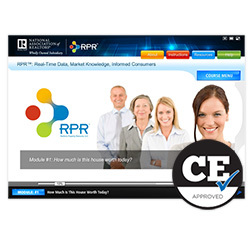 Finally, take the power of RPR® with you and learn about RPR Mobile™. For more information about RPR® and the benefits available to agents (residential and commercial), brokers, associations, appraisers and MLSs, visit blog.narrpr.com.